← Are ‘OTTs’ making network economics unsustainable? 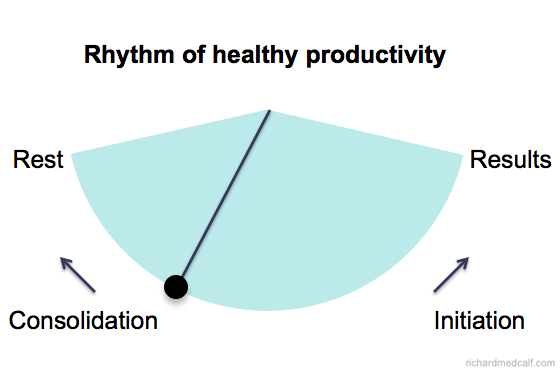 There will be no blog posts during August, because I am respecting the essential Rhythm of Healthy Productivity. In this post, I pause the telecoms analysis for a minute and take time to explain the 4 phases of this essential discipline, and why you need to take your summer vacation seriously! Whilst occasional emergencies can disrupt the best-laid plans, we owe it to ourselves, our families and, yes, our employers to thoroughly disconnect and rest during our summer vacations. Results: This is the “far end of the pendulum swing”, where we feel the most productive: our investments are paying off, we are making an impact, we feel like the “machine is humming”. This can feel like the “top of the mountain”: people acknowledge our success, we feel good about ourselves! We often long to stay there. Consolidation: However, the results phase is tiring and we are so focused on harvesting the results of our efforts that we tend to get tired, get over-stretched, and lose perspective. The swinging back of the pendulum takes us into a phase of consolidation. This is an uncomfortable time of pruning, of stripping away, of reprioritisation, of creating space in the diary once again. We need to take time to reflect on what is important, to see what is working and what isn’t, and to make hard choices of what to continue investing in and what to cut. Rest: I started with the “Results” end of the pendulum swing – but actually it all starts here at the “Rest” end of the pendulum. Rest time is essential. We need to step back, re-connect with what really matters in our lives, to re-engage with the people who really matter to us and re-charge our bodies and minds. We stop doing and start being, and we gain a whole new perspective and energy. Initiation: Fully rested, we can now initiate the next wave of projects and tackle new opportunities that will take us towards a new and higher-level of results. This is a growth season of starting, of launching and of designing. The amazing thing about this rhythm is that it can be carried out across many timeframes. On a daily basis, we rest (sleep, perhaps pray or meditate on our day ahead) as well as deliver results (work). But we must also make time to do this on an annual basis – hence the importance of true down-time during vacations, where you can consolidate and rest and be ready for the next season of growth and productivity. So, August for me is a time of consolidation and rest. I am not on vacation the whole month, but am using the time to cut down on activities, consolidate, step back and focus on the essentials. There will be no blog posts during August, but there are already a number already planned for September (including finishing the FASP4 series). Look out for one last post before the break! Are you jammed up at the “Results” end of the pendulum or in a healthy rhythm of Results and Rest? Are you ready to reconnect, reengage and recharge? 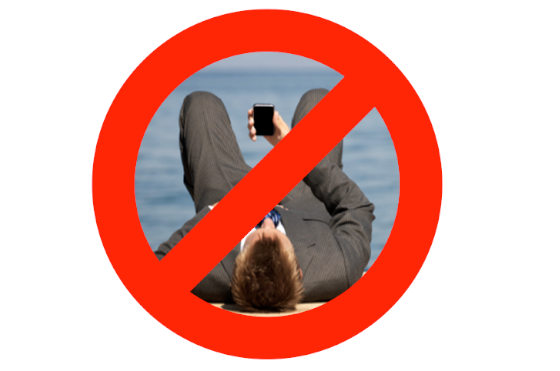 How do you protect your vacation time from becoming diluted with other commitments?